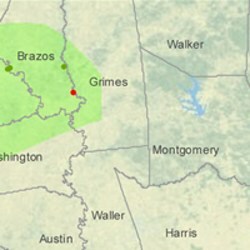 Grimes County (801 sq miles) is in southeast Texas where the Eagle Ford Shale is present. Grimes County falls in the fairway of the oil maturity window of the Eagle Ford Shale, but little activity has taken place thus far in respect to horizontal drilling. The southern half of the county is prospective for gas production. Operators are testing the potential of the play in this area. Some have commingled production of the Eagle Ford and the Woodbine formation through vertical wells in surrounding areas where the Eagle Ford Play is present. The county is historically know for producing gas from the Austin Chalk formation and oil from the Woodbine formation. County services of interest to oil and gas lease owners include the Grimes County Appraisal District (tax collector) office and the Grimes County Clerk (property records) office. Grimes County is located approximately 100 miles northwest of Houston, TX. The county seat is the town of Anderson. Other towns in Grimes County include Bedias, Iola, Navasota, and Todd Mission. Join the Grimes County Discussion Group today - your voice counts! Enervest and Southern Bay Operating are the largest producers with operations in Grimes County.